In science, control of interactions at the molecular scale is the ultimate goal, as this in turn determines all macroscale behaviour. 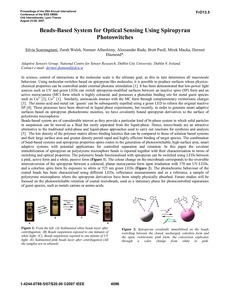 Using molecular-switches based on spiropyran-like molecules, it is possible to produce surfaces whose physico- chemical properties can be controlled under external photonic stimulation . It has been demonstrated that low-power light sources such as UV and green LEDs can switch spiropyran-modified surfaces between an inactive spiro (SP) form and an active merocyanine (MC) form which is highly coloured, and possesses a phenolate binding site for metal guest species such as Cu2+ , Co2+ . Similarly, aminoacids interact with the MC form through complementary zwitterionic charges . The amino acid and metal ion 'guests' can be subsequently expelled using a green LED to reform the original inactive SP . These processes have been observed in liquid phase experiments, but recently, in order to generate smart adaptive surfaces based on spiropyran photochromic moieties, we have covalently bound spiropyran derivatives to the surface of polystirene microspheres.